Using test customers, up to 50% of goods in the lower area of the shopping trolley were incorrectly registered. A system was needed that would allow the cashier assistant to check as to whether products were being smuggled out of the store (hidden out of sight on the lower area of the shopping trolley). The system required should however not interfere with the current check-out system. Another essential criteria, the possibility to control the staff and record on video as to whether the shopping trolley was indeed being controlled. Test customers at a well known German chain discovered that a high percentage of goods were passing through the check-out without being registered. Certus, using experience gained in their own retail outlets set about designing such a system, bearing in mind the requirements necessary. 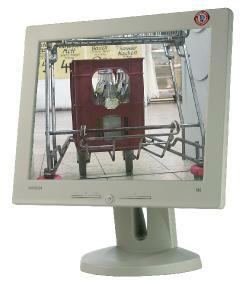 The Wa-Con system is very simple to operate and eases the check-out personals job of controlling the shopping trolley. No Numbering of Shopping Trolleys! No Complicated Check-Out Design Necessary! A shopping trolley is fitted with small reflective stickers, they reflect a ray of light emitted from a photo diode mounted on the cashier table. 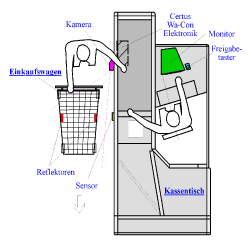 The reflected light triggers a photo sensor which is then passed onto the Wa-Con electronic. The electronic activates a camera mounted on the cashier desk, a still picture of the lower shelf of the shopping trolley is taken and sent to the POS monitor. It is no longer possible to process the customer, the POS display shows only a still picture of the lower area of the shopping trolley. When the cashier assistant wants to finish continue processing the customer, they must acknowledge the picture displayed on the monitor. Only after pressing the release button, is it possible to finish processing of the customer. The release button returns the monitor to the original POS display. Our the system does not directly enter the cashier system, an installation on every common cashier system is possible. Installing and operate the system is very easy. It requires little or no backup support.